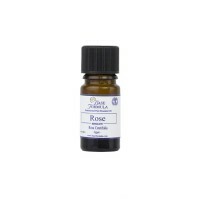 Rose Damascena Absolute has a deep, rosy, fresh aroma. 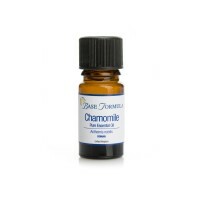 It is the best essential oil for female reproductive problems. It also has powerful aphrodisiac and antidepressant properties, and is excellent for use in skincare. Rosa damascena (also known as the damask rose) and Rosa centifolia are the two main species of rose used in the production of rose essential oil. Most Rose Absolute is obtained from the damask rose which is widely cultivated in Bulgaria, Turkey, Iran, India, Russia and China. Rose Absolute is obtained by solvent extraction, whereas Rose Otto is obtained by steam distillation. The solvent extraction method involves agitating the rose petals in a solvent such as hexane. This isolates the aromatic compounds as well as pigments and wax. The extracts then undergo vacuum processing to remove the solvent, leaving a wax-like material known as the ‘concrete’. This is mixed with alcohol to dissolve the aromatic compounds, leaving behind the wax and other substances. Low-pressure evaporation is then used to remove the alcohol which yields the final Rose Absolute. Due to the low temperatures used in the extraction process (compared to steam distillation), the aroma of Rose Absolute oil tends to be closer to the true scent of fresh rose than Rose Otto. Rose Absolute is therefore often used in the manufacture of perfumes and cosmetics whilst Rose Otto essential oil tends to be used for therapeutic purposes. Rose oil commands a high price as the extraction process requires up to several thousand pounds of rose petals to obtain a single ounce of oil. The production process is also very labour-intensive, with harvesting of the flowers done by hand, before sunrise, with processing completed on the same day. Despite its high price, Rose is considered to be the finest of all essential oils, and the first choice for treating problems related to the female reproductive system and sexuality. Do not use in early pregnancy or where there is a history of miscarriage. Rose Absolute oil is beneficial for all types of skin, but is especially useful for dry, sensitive and ageing complexions. It helps to soften, soothe, hydrate and rejuvenate the skin. It has a tonic, and astringent effect on the capillaries, and the circulation in general, which may help to reduce the redness associated with thread veins. Rose oil is a powerful antidepressant and beneficial for treating a variety of mental and emotional problems, particularly where the issue is related to female sexuality, the reproductive cycle (i.e. PMS, PMT, post-natal depression, menopause), grief or loss. Rose has a unique action on the female reproductive system and a particular affinity with the uterus. It can help to regulate the menstrual cycle, ease cramps, and may even help to aid conception where an irregular cycle is present. It is also known as a powerful aphrodisiac and may be helpful for female frigidity and male impotence. Blends well with: Lavender, Geranium, Sandalwood, Patchouli, Bergamot, Clary Sage, Benzoin, Citrus oils, Roman Chamomile.